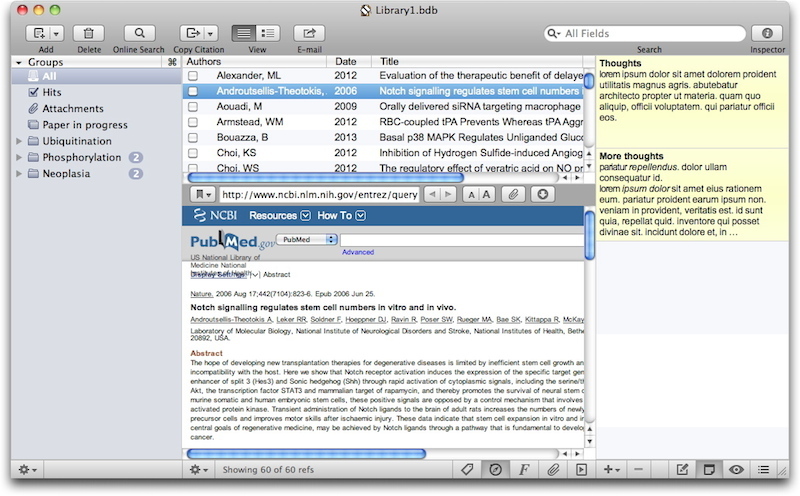 Bookends 12.1.1 – Reference management and bibliography software. Access the power of Bookends directly from Mellel,Nisus Writer Pro, or MS Word (including Word 2011): Bookends allows you to scan your existing word-processor files and automatically generate finished manuscripts with properly formatted bibliographies. You can also scan Apple Pages ’08, ’09, and 5, and OpenOffice 3 files, or RTF files saved from any word processor. Note: Bookends 12.x is a paid upgrade for owners of Bookends 11 and earlier and requires a new serial number. It is free for anyone who bought or upgraded to Bookends 11 on or after January 1, 2013. The upgrade price for a single license is $29 for those who bought Bookends before January 1, 2013. Bookends will find many more PDF attachments for references in EndNote XML files exported from Sente. Title words beginning one or two spaces after a semicolon or period will be capitalized when Title Case is used, even if they're on the exclude list. Library of Congress and Google Scholar searches were updated to work around changes made by those services. If a format calls for the last two digits of the second page in a page range be output, a leading 0 will be ignored. The right-click contextual menu in the group pane has an option to rename the selected group. Next story Flood 1.6.6 – Photoshop plug-in that submerges objects in realistically-rendered water. Previous story Coollector Movie Database 4.1.3 – Personal movie and video collection manager. xPlan 3.6 – Track your projects. MindNode Pro 1.10.6 – Elegant mindmapping application. Tableau Desktop 10.2.0 – Business analytics application for OS X.